Mary Francis Young was born on 23 February 1923 in Pratt, Kansas, the daughter of Jack Fant and Mary Francis (Milstead) Young. When she was very young, her family moved to the Pacific Northwest, where she raised. She studied at Maryville State College. On 24 October 1943, she married Daniel Charles Shura, who died in 1959. They had two children: Marianne Francis Shura (Spraguc) and Daniel Charles Shura. On 8 December 1961, she married Raymond C. Craig, they had a daughter Alice Barrett Craig (Stout), before their divorce. 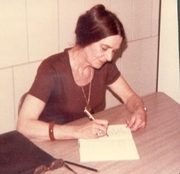 Since 1960, she wrote over 50 books of various genres: children's adventures and teen-romances as Mary Francis Shura, M. F. Craig, and Meredith Hill; gothic novels as Mary Craig; romance novels as Alexis Hill, Mary Shura Craig and Mary S. Craig; and suspense novels as M. S. Craig. Her children's novel "The Search for Grissi" received the Carl Sandburg Literary Arts Award in 1985, and she also was nominated to the Young Hoosier Book Award. In 1990, she was elected president of the Mystery Writers of America. She lived in Hinsdale, Illinois, where her apartment burned on 13 December 1990. At 67, she died of injuries suffered in the fire on 12 January 1991 in Loyola University Medical Burn Center in Maywood. Mary Francis Shura is currently considered a "single author." If one or more works are by a distinct, homonymous authors, go ahead and split the author. Mary Francis Shura is composed of 20 names. You can examine and separate out names.